The first month of autumn is nearly over and Gurtam team is ready to present a new Wialon Hosting update. Thanks to close cooperation with our partners in the framework of Wialon community, we were able to introduce a number of really significant advancements of Wialon platform. Unit properties dialog, geofences, report templates, notifications, map layers, applications tab and CMS manager were subject to changes. Let’s take a closer look at the result. Notification system evolved as well with a number of modifications added. Choose “Display online notification” as a measure to be taken when a notification triggers and mark “Blink minimap” option to see visual effect upon notification. The time notification is received a minimap highlighted by red color appears. Moreover, you can see the number of unread notifications and look through notifications for the selected unit in the minimap window. Choosing “Idling” as a notification trigger you will see that maximum idling time allowed was increased to 99 hours for the drivers who really need more time. 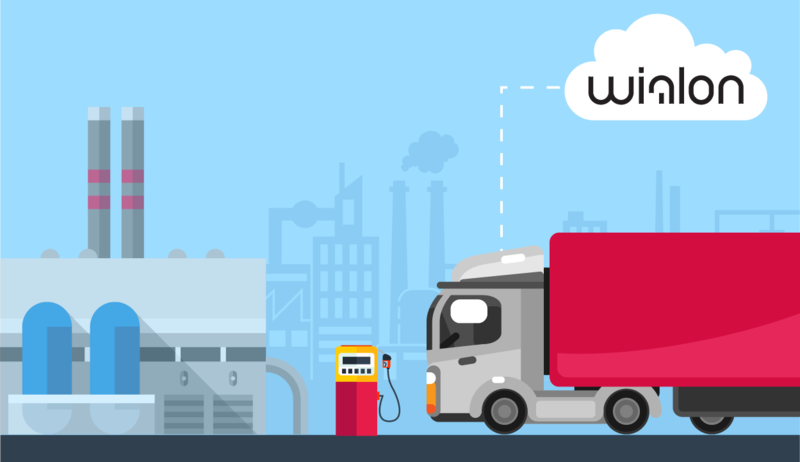 For your convenience fuel theft and fuel filling notifications triggers were added with an opportunity to add sensor masks, inside and outside geofence (geofence groups) control, and an option to create events only for new fillings and thefts. The notification triggers for every fuel level sensor individually, ignoring “Merge same name sensors” parameters. In addition to trailer and driver groups our development team created geofence groups and made unit groups dynamic. The nature of geofence groups is similar to the one of driver and trailer groups. 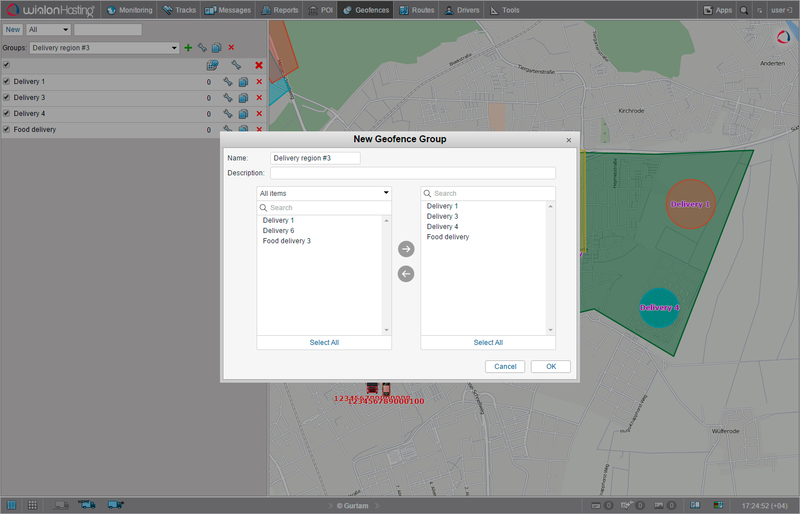 You can differentiate between geofences groups of different types, efficiently manage thousands of geofences and demonstrate them on the map. The update is aimed to extend Wialon report-building potential and improve notification and filtration systems. As for dynamic groups of objects, there’s an opportunity to bind jobs and notifications to a group, taking into account variations in unit set of the group. In this case adding and deleting units in the group will not be followed by introducing changes in jobs and notifications, thus eliminating the need for manual adjustment. Apart from the opportunity to show information, based on tachograph or iButton data, in units’ or drivers’ tooltips available from July, advanced properties were supplemented by driver activity settings. Using the dropdown list a manager can choose the source to identify driver activity on the basis of tachograph or bindings data, thus minimizing working schedule violations and encouraging compliance with AETR requirements. If “None” is selected, a pop up info tip and extended information window will not contain data on driver activity. If “Tachograph” is selected, data on driver activity is obtained from tachograph installed on the vehicle. Selecting “Bindings” you register driver status on the basis of data on trips and assignments. Refer to Wialon Hosting documentation for more information on driver activity settings. Previously, while creating a report template you were allowed to set four sensor masks to be considered during report generation. In the updated version we made the number of sensors masks unlimited, thus strengthening filtering options and adding better precision to fuel data obtained. By sea or by land, Wialon guarantees better performance. That’s why we added support of OpenSeaMap with Marine, Elevation and Sea Marks profiles available for those involved in overseas transport to see lighthouses, piers, docks and other useful maritime marks. Please note, that after choosing Sea Marks layer, map tiles with no sea areas will be unavailable. Gurtam team is constantly working upon Locator tool and while the latest update granted us an opportunity to choose all units to be available via Locator link, from now on we don’t need to update Locator page to see the units automatically added to or deleted from the monitoring list. Resource contents restoration function announced in the previous update aroused much interest among Wialon users and our development team decided to satisfy it as soon as possible. In September you had a chance to enjoy its operation in the development thread with resource elements icons missing after restoration procedure. New Wialon Hosting update grants you the opportunity to use resource contents restoration function to the full extent. A click on «Restore contents» button in account properties dialog and the necessary date chosen allow you to restore resource contents with all relevant settings and resource elements icons in place and functioning. No mistake is fatal with new Wialon time machine. Continuously adopting the system to operate with touch screens we provide our product with greater mobile capacities. This time our team was focused on double tap option enhancement, which is now used for POI and geofences creation and editing, track player tool utilization, dialogs management, and also to launch mini-windows from monitoring list, send routes via commands and other minor system adjustments. With more options available after each update Wialon aims for perfect mobility. As for design improvements, we changed Apps display mode in the monitoring interface. Gurtam team turned the applications list into a set of icons, simplifying access to relevant applications and making them look better. In addition, Summer and Indigo skins were introduced for monitoring web-site design, making the color scheme even more diverse. Last but not least, changes in CMS manager can be observed. The date of unit creation column was added in «Units» table, eliminating the need to search for relevant information in messages and custom fields. It should be noted, that from 01.10.2015 core/login authorization will no more be functioning due to token-based authorization implementation. 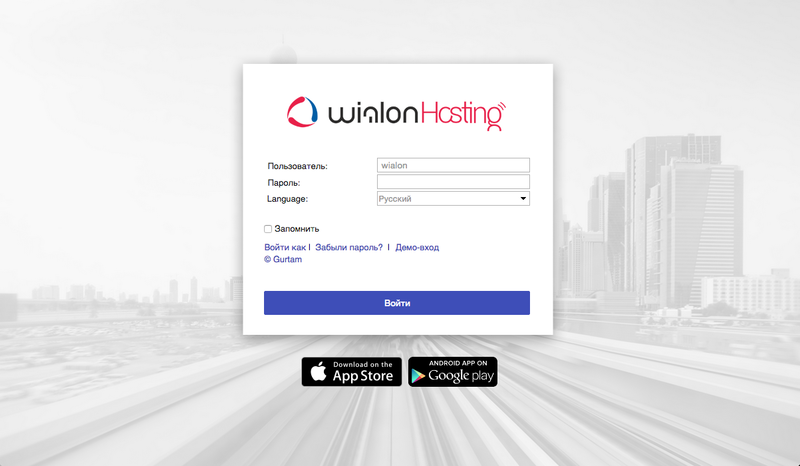 We hope the new Wialon Hosting update meets your expectations and will bring new opportunities to your business. If you have any ideas or suggestions, don’t hesitate to visit our forum and contact our specialists. Have a good week. The new Wialon-based solution to control tyre pressure and temperature. Controlling transport vehicles and in-house machinery.